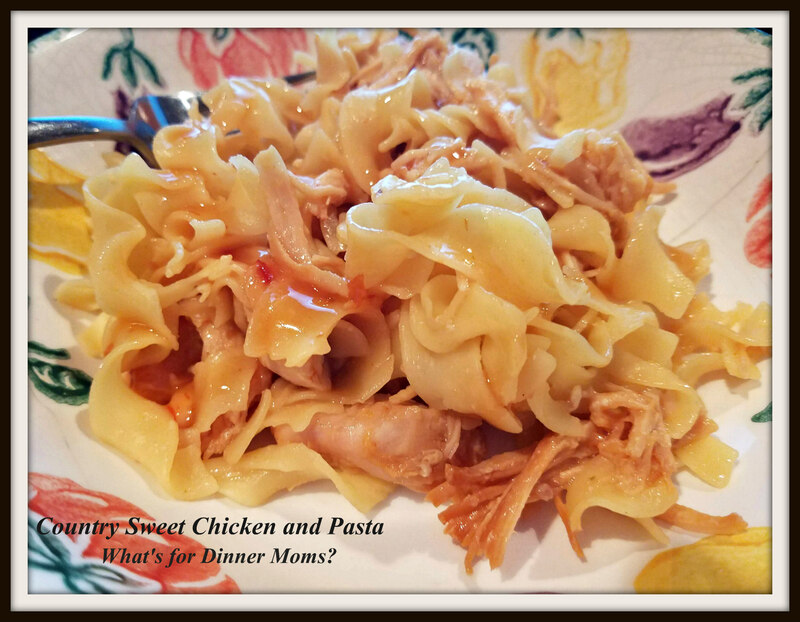 Country Sweet Chicken and Pasta – What's for Dinner Moms? When I was back home in Rochester, NY for the conference two weeks ago I had a grocery list of items to bring back to my family. This was one of them. 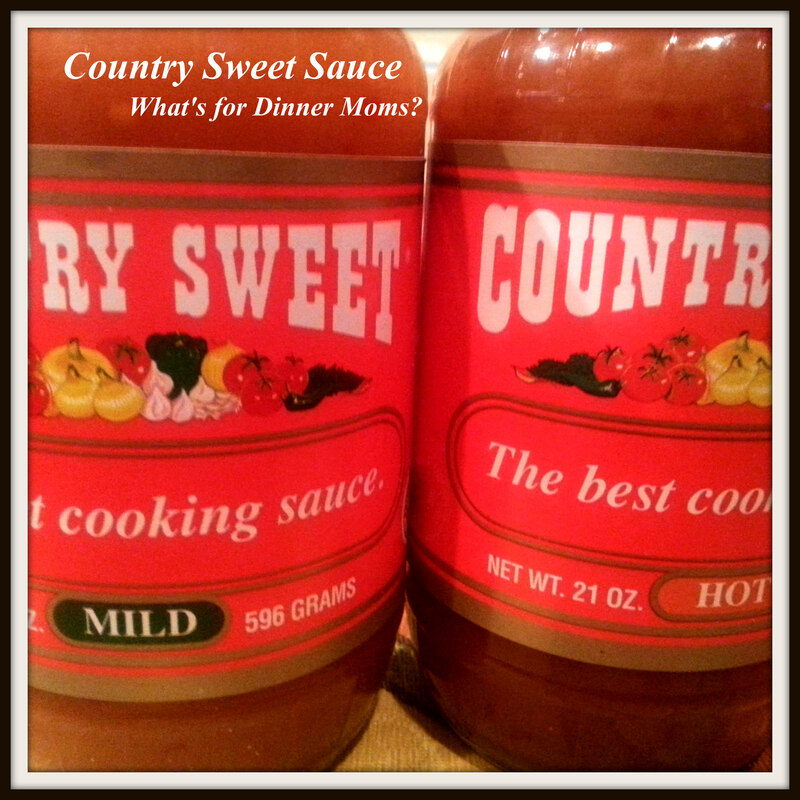 Country Sweet Sauce is a Rochester item. You put it over chicken wings, chicken, pasta, whatever you want. It reminds me almost of a cross between a sweet Asian chili sauce and a sweet and sour sauce. It definitely has hints of pineapple in it with a bit of heat at the end. I used two of the bottles to make dinner the other night. I felt decadent using part of our “Rochester stash.” But, as I said yesterday meals are going to be a bit simpler and include some jarred or canned ingredients to make partially homemade dishes. My family was eating the chicken right out of the slow cooker. It smelled amazing and that sweet chicken with just a hint of heat at the end. Everyone drizzled a little extra sauce over the egg noodles and chicken for a little saucier dish. I served this with a green vegetable and green side salad to complete the meal. A delicious sweet sauce with a hint of heat makes this delicious chicken dinner. In a slow cooker mix chicken breast and 1 1/2 jars of Country Sweet sauce. I saved the rest to drizzle over the top. Shred chicken with 2 forks. Mix well. Serve chicken and sauce over noodles. Drizzle with extra sauce and serve. Yes, but if you don’t have the country sweet sauce or live in Rochester…? What’s a substitute–equal parts of the Asian chili and sweet and sour sauce? It is available online from Amazon for $5.99 a jar or I would mix a bit of sweet and sour sauce into the Asian Chili until it is something you like. I will have to experiment with proportions on that. Yes, they have it at Wegman’s! It is near the hot sauces, etc… It comes in hot (which I think is too hot) and mild. We also brought back Grandma Brown’s Baked Beans which are different from most baked beans. Add a bit of brown sugar to them and bacon on top (if you like) and bake them. They are softer and creamier than most baked beans. Salt potatoes, which are always a hit in our family and a chocolate Wegman’s cake. I love their bakery chocolate cake! Yes! I went to Charlie’s on Empire, my favorite.